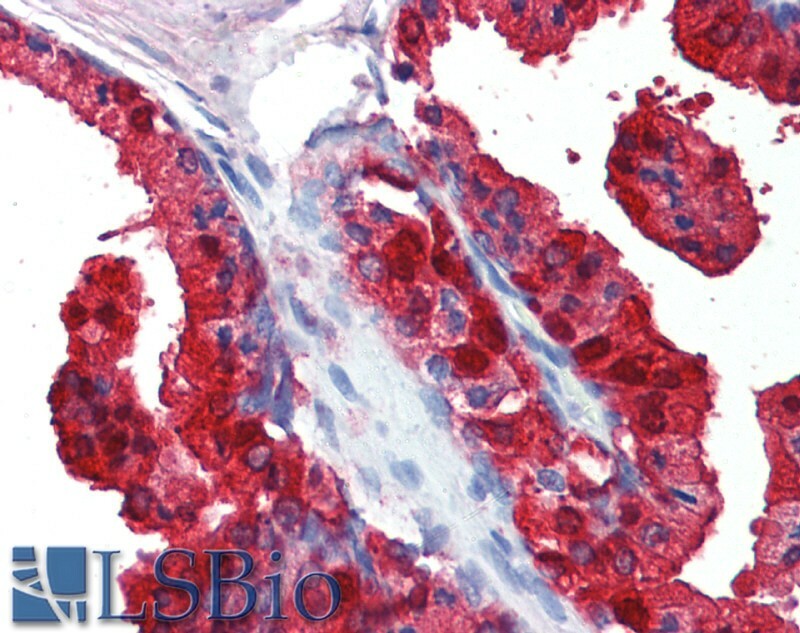 EB06601 (0.1µg/ml) staining of Mouse Kidney lysate (35µg protein in RIPA buffer). Detected by chemiluminescence. EB06601 (5µg/ml) staining of paraffin embedded Human Prostate. Steamed antigen retrieval with citrate buffer pH 6, AP-staining. This data is from a previous batch, not on sale. Western blot: Approx 38kDa band observed in Mouse Kidney lysates (calculated MW of 38.3kDa according to NP_003095.1). Recommended concentration: 0.1-0.3µg/ml. A minor band of unknown identity was also consistently observed at 48kDa. This band was successfully blocked by incubation with the immunising peptide. Primary incubation was 1 hour. Niimi N, Yako H, Takaku S, Kato H, Matsumoto T, Nishito Y, Watabe K, Ogasawara S, Mizukami H, Yagihashi S, Chung SK, Sango K.
A spontaneously immortalized Schwann cell line from aldose reductase-deficient mice as a useful tool for studying polyol pathway and aldehyde metabolism.